Click to print your chart. 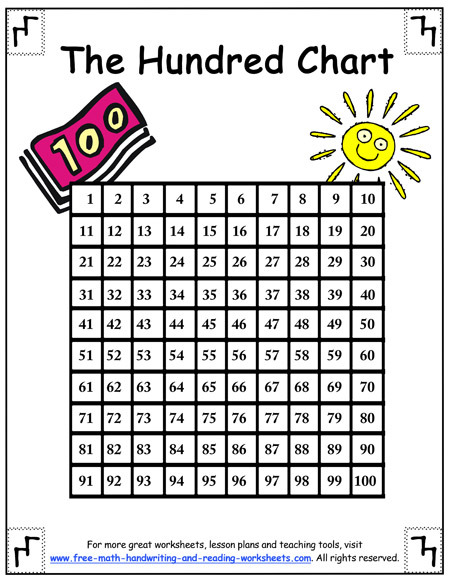 The hundreds chart is a traditional math tool to help young students visualize number patterns that occur between one and one hundred. As you can see above, ten rows of ten are laid out one on top of the other which makes it easy to visualize that 11 is right over 21 (ten more than eleven), 21 is right over 31, and so on. 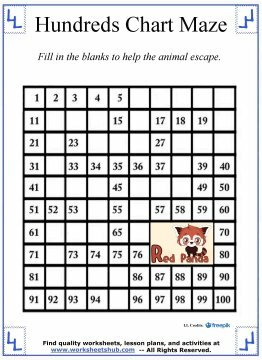 Using the hundreds grid, you can easily show your students how to count by tens, since multiples of ten are all found in the last column, aligned vertically. It's also a good way to introduce the concept of place value as you can easily see how the tens and ones columns are laid out. After your child has worked with this tool for a while, the next step is to learn skip counting, a building block to multiplication. I suggest you begin with learning how to count by tens. If you follow the link above, you will find some supporting tools to help teach skip counting by tens, and from there you can move into skip counting by fives, then twos, threes, fours, sixes, sevens, eights and nines. 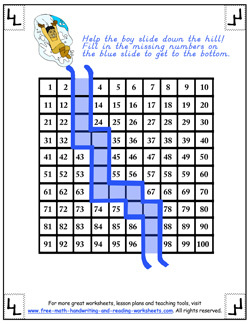 Here are a few activity sheets you can use to teach your child about the numbers from 1 to 100. 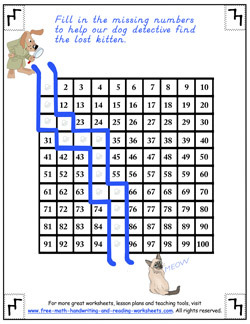 They're all simple maze-like activities that task your child with filling in the missing numbers to complete. Click on the images below to open up a PDF file in another tab. 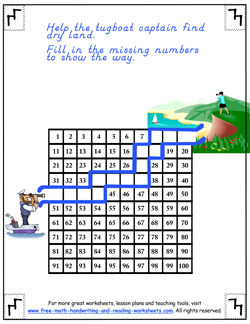 There are many great activities that you can plan using the hundreds table. You can create your own basic counting worksheets by blanking out numbers and having your child (or students) fill in the missing numbers. 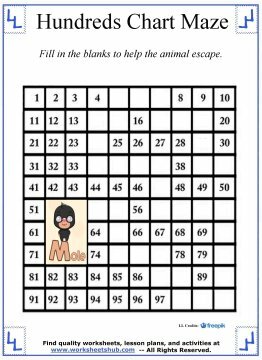 Another exercise that you can try is to have your students look for patterns within the grid, without your assistance, in the different rows and columns. They will normally be able to spot sequences of 5's, 10's, etc.,) without help. Have them color in the patterns that they see. For example, color every fifth number red. This tool can also be used similar to a number line when you start working on addition and subtraction problems. 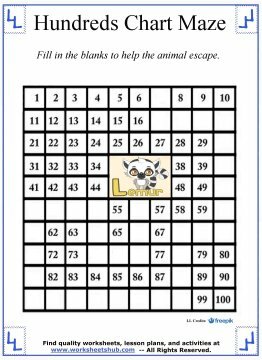 Make sure that you take advantage of the free worksheets I've prepared below to help your child understand numbers, addition, and place values--all things that this chart can be used for.